Great Britain caused the biggest stir on the opening day of the Team Events, as Sam Walker and Co. stunned France in a marathon match of Table Tennis. The Women's Team competition saw China dominate against the hosts Brazil, as Liu Shiwen made her Rio 2016 entrance. The Men’s Team tournament has well and truly kicked off, after Great Britain came from behind to beat France in a four hour epic. Simon Gauzy had given the French the lead with a 2-3 win over Liam Pitchford, but Paul Drinkhall came back from 1-2 down to see off Emmanuel Lebesson 3-2 to bring the tie level heading into the doubles. Britain looked set to take the lead in the match for the first time when Drinkhall and 21-year-old Sam Walker went 2-0 ahead, but France’s Tristan Flore along with Lebesson fought back to put themselves 1-2 in front in the tie. Then all of a sudden France sat in a more comfortable position, as Flore won the opening two ends against Pitchford in a best of five encounter. However, Pitchford had other ideas and managed to turn the match on its head (3-2) to keep Great Britain in with a chance. Sam Walker was the country’s final hope, but with his opponent (Gauzy) ranked 17th in the world compared to Walker’s 131st rank, the odds weren’t on the young Brit’s side. Gauzy made the better start out of the two players taking game one (7-11), but Walker began to grow in confidence and soon found himself ahead, winning the next two games (11-8, 13-11). The fourth end proved to be another close game which Gauzy narrowly edged (9-11) to set up a cracking finale to the match. Walker made a great start to game five, but Gauzy then raised his performance moving 7-10 up with three match points in his hands. The opportunity had appeared to have slipped away from Walker, but he refused to give in and won five points in a row to put Great Britain into the quarter-finals. “I was quite focused, obviously it is a noisy hall. But the support of our guys, and it was amazing, that kind of helped me get through it. When he (Gauzy) was up 10-7 (in the decider), I was still focused and I never stopped believing that I could still win it.” – Sam Walker. China came through their match against Nigeria with relative ease, as Africa’s sole country in the Men’s Team category exited to the London 2012 title holders. Xu Xin got China going with a victory over Segun Toriola, who was honoured for competing at his seventh Olympic Games. Although they didn’t drop a match, one of China’s players did drop an end and that was the newly crowned Men’s Singles gold medallist Ma Long. Games one and two went according to plan for Ma (11-6, 11-3) but Quadri Aruna, who had lost 4-0 to Ma in the singles quarter-finals, snatched the third end with a rather convincing win (5-11). Order was soon restored as Ma Long took the next game comfortably (11-2), but signs of improvement from Quadri Aruna have become apparent throughout Rio 2016. 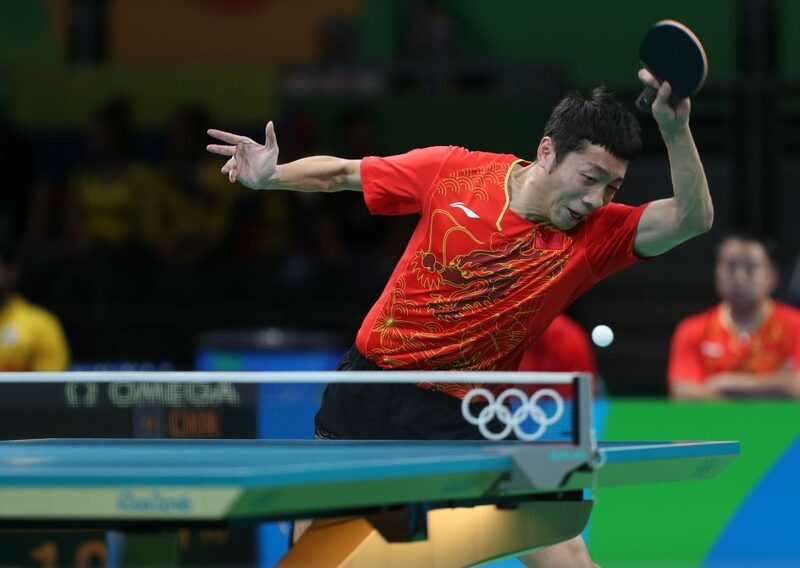 Zhang Jike and Xu Xin suffered no troubles against Segun Toriola and Bode Abiodun, with the Chinese players claiming a 3-0 win. Brazil were eliminated from the Men’s Team event, as Korea Republic stormed to a 3-0 win. 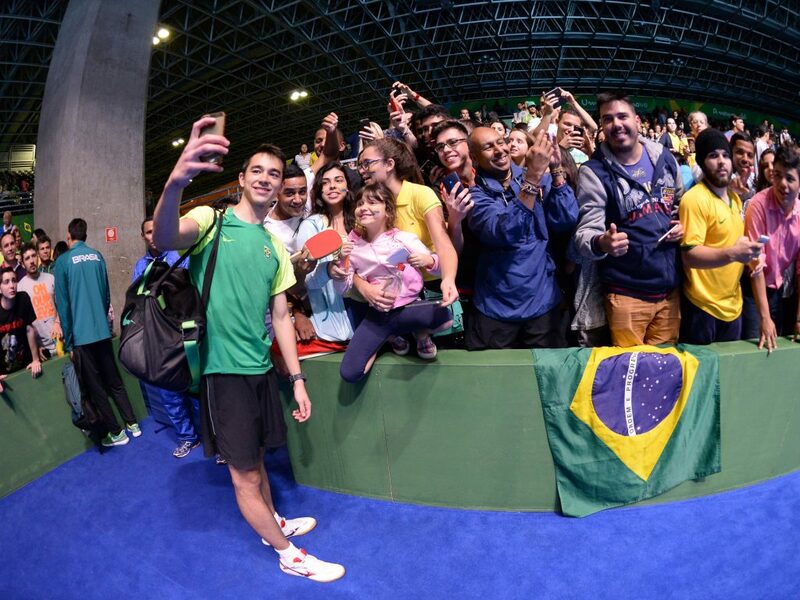 Hugo Calderano, Cazuo Matsumoto and Gustavo Tsuboi enjoyed the added benefit of the overwhelming fan support, as the Brazilian spectators attempted to lift their team beyond the opening round. However, it was Korea’s Joo Saehyuk, Jeoung Youngsik and Lee Sangsu who left the Riocentro the happier of the two sides. The first match was between the home favourite Calderano and Korea’s master of defence Joo, with the latter player giving his country a 0-1 lead after a straight games win. Matsumoto then stepped up for Brazil, giving Jeoung a good match, but again Korea came out on top with a 1-3 victory to close in on a place in the last eight. Jeoung was then called up for the doubles to play alongside Lee, as the Korean team beat Tsuboi and Calderano to set up an encounter with Sweden, after they had knocked out USA 3-0. 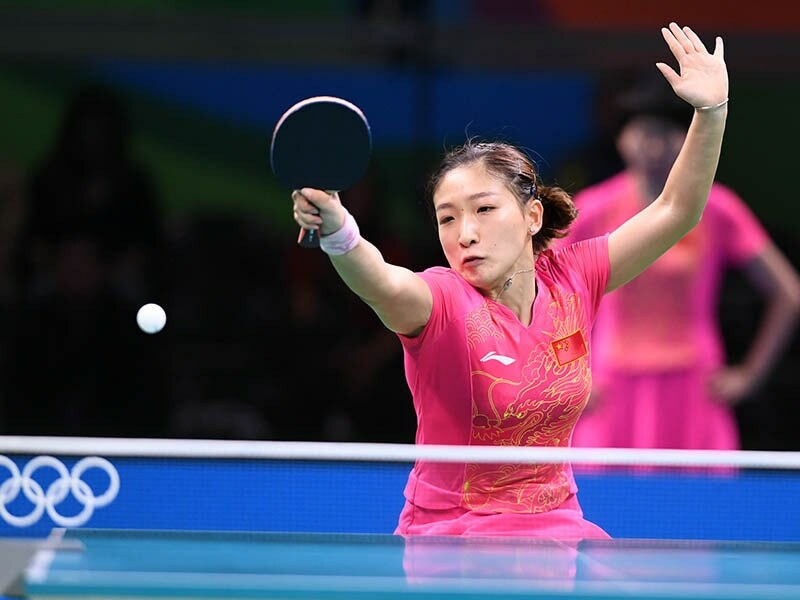 Reigning Olympic champions China silenced the home fans as Liu Shiwen, Li Xiaoxia and Ding Ning beat the Brazil team of Gui Lin, Bruna Takahashi and Caroline Kumahara. The match ended 3-0 to the first seeds, who were never really challenged by the host nation throughout the tie. Liu gave China the lead with her victory over Gui (11-8, 11-5, 11-3), before her teammate Li disposed of the 2015 ITTF Cadet Challenge winner, Takahashi (16) also by a 3-0 score (11-7, 11-8, 11-1). Brazil needed to win the doubles contest to stay in the tie, but the duo of Kumahara and Gui proved no match for Ding and Liu who secured China’s position in the quarter-finals (11-1, 11-4, 11-4) where they will face DPR Korea following their 3-0 win against Australia. “We prepared very well; we were calm, because we knew that our opponents were very very strong. We know that they represent the best level of Table Tennis in the world. I am very happy to be able to play against them. We have a lot of to learn from them.” – Gui Lin. Korea Republic and Romania were involved in a nail-biting encounter which went right down to the wire, as neither team could be separated after the opening four matches. Jeon Jihee gave Korea the early lead as the 23-year-old negotiated the 2015 European women’s champion Elizabeta Samara (3-0). However, Romania fought back to level the tie at 1-1, as Daniela Monteiro Dodean shocked Suh Hyowon without dropping a single game. 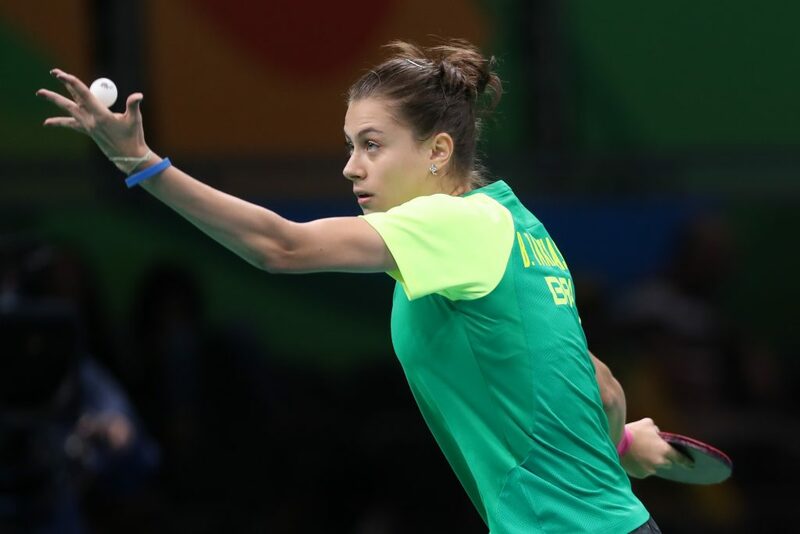 Monteiro Dodean was then joined by Bernadette Szocs in the doubles, but the Romanians lost out to Jeon and her partner Yang Haeun (12-10, 9-11, 13-11, 11-8) to put Korea Republic firmly in the driving seat. 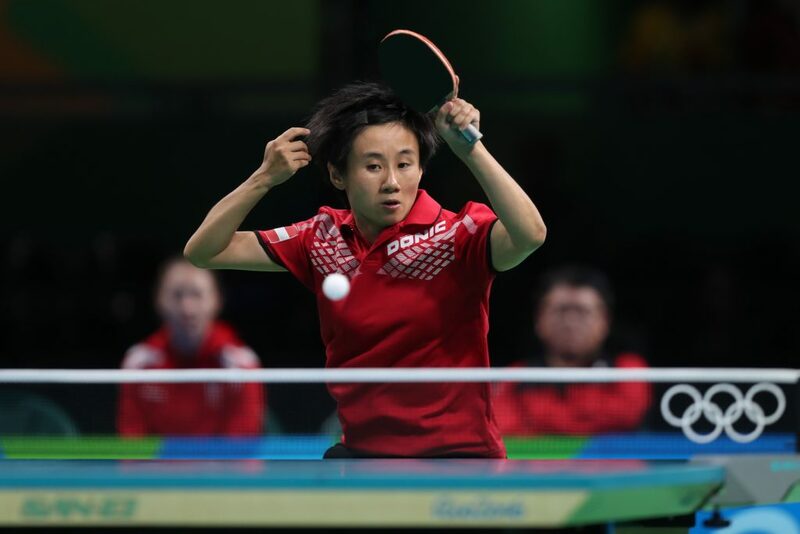 Samara’s second singles match was against Yang, and it was Romania’s turn to shine as Samara overcame her opponent 1-4 to force one more tie. However, it was not to be for the European side as Suh defeated Szocs in seven ends (11-13, 14-12, 12-10, 9-11, 11-7) to book Korea Republic an exciting fixture with Singapore in the next round. “I just tried to focus on what I had to do and not think about the score. In the last match in the fifth game I tried to make as many changes as possible, sometimes defend, sometimes attack,” said Suh Hyowon after her win against Bernedette Szocs. The other teams who have progressed into the Women’s Team quarter-finals are: Japan and Austria, who will meet one another after respective wins against Poland (3-0) and the Netherlands (3-1), and Hong Kong and Germany who beat Chinese Taipei (3-1) and USA (3-0).